The Premier League’s four representatives all made it through to the last 16. Four English teams have progressed from this season’s Champions League group stage, continuing the Premier League’s strong recent track record. Here, Press Association Sport looks back over the history of the competition in its current structure. Since the last 16 stage was reintroduced in 2003-04, English clubs have appeared in that round of the competition 55 times. The only nation which can rival that tally is Spain, with Barcelona, Real Madrid and Atletico Madrid all through this season to take the total to 50. Italian clubs rank next on 38, with Germany on 36, France 25 and Portugal 16. Spanish clubs, though, have the superior track record of reaching the later stages of the competition. 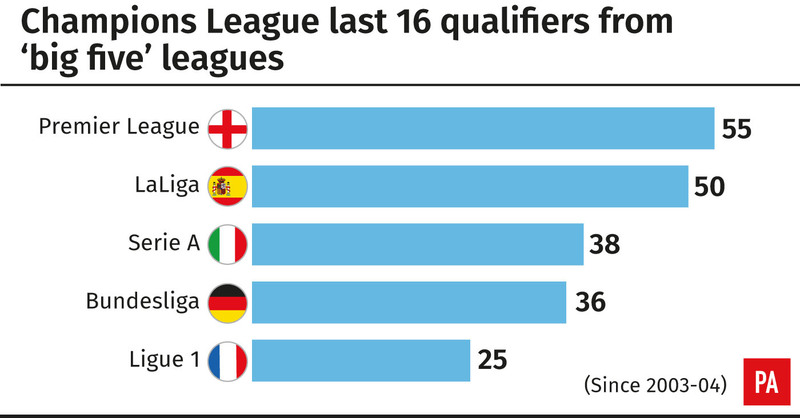 There have been 31 Spanish quarter-finalists to 28 from England, 21 to 18 in the last four and 10 Spanish finalists, one more than England. Most striking is the fate of those finalists, with LaLiga bringing home eight titles to the Premier League’s three. Real and Barca have four each in that time, combining for more than half of the 15 available and each exceeding the tally of any other full league. Arsenal and Chelsea, both in the Europa League this year, have led the way for England in the higher-profile competition by qualifying from their group 14 and 13 times respectively and met in the 2003-04 quarter-finals. Real Madrid are the only team to progress on all 16 occasions, with Barcelona and Bayern Munich each recording their 15th appearance this year. Manchester United have qualified this year for the 11th time in 16 seasons, as have Porto, while Juventus and Lyon have joined AC Milan on 10. Last season saw a record five English teams in the last 16, with Manchester United’s 2017 Europa League win earning the Premier League an extra qualifying spot. The league has sent at least three teams to the knock-out phase every season since 2013-14 and in all but two years of the current format. One of those two exceptions was 2011-12, when only Chelsea and Arsenal made it through their groups. The Gunners were beaten by Milan in the second round but Chelsea went all the way to lift the trophy in Munich.